“This luxurious tanning butter will leave even the driest and most sensitive skin hydrated, and soft to the touch. Formulated with shea butters- allows this thick, rich butter to just softly melt into the skin. Isn’t it time you give your skin the treatment it deserves? 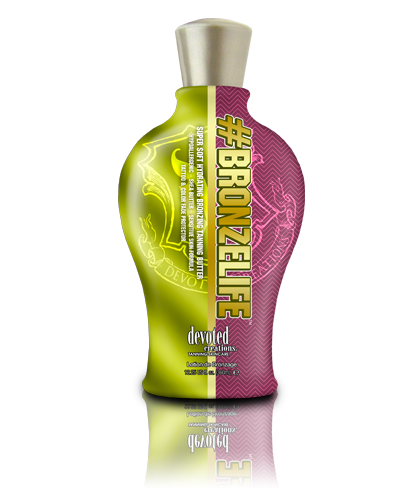 Hydrate, bronze and protect… Go ahead, live The #BronzeLife™. Transfer Resistant Dark DHA Bronzers. Super soft tanning butter builds and maintain skins natural glow. Sensitive Skin Shea Butter Formula. AcquaCell™ for fine line and wrinkle reducing benefits. Extremely hydrating tanning butter designed to moisturize even the driest skin. Potent transfer resistant DHA bronzers for optimal, fast acting, transfer resistant results in just 4 hours. AcquaCell™ – Rapid fine line and wrinkle reducer. Tattoo & Colour Fade Protectors - Protects the colour and lustre of your tattoos.